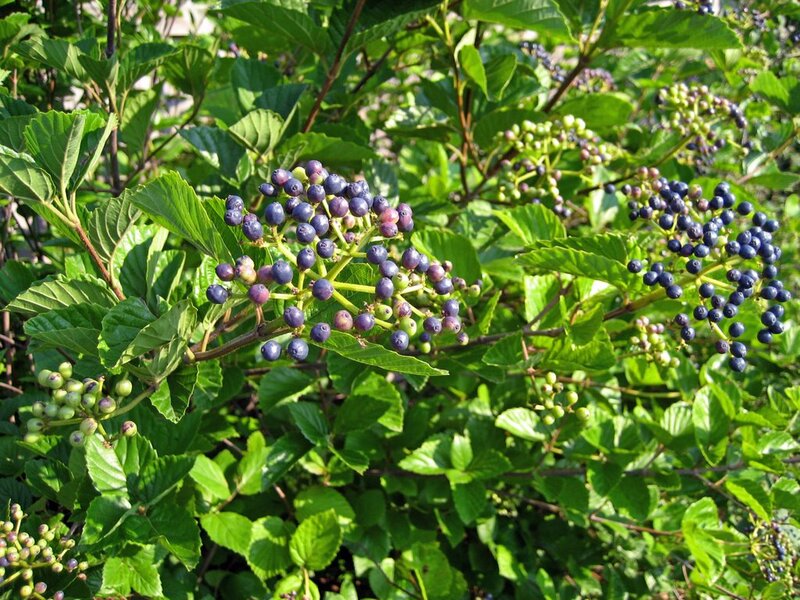 This is some blue fruit (berries) on one of my viburnums, Viburnum dentatum "Chicago Lustre". I don't think people plant enough viburnums and other large shrubs in the landscape. At least I don't see that many large shrubs in my neighborhood. I think that is just wrong. These large shrubs are providing food for birds and shelter as well. Plus, they flower in the spring and the foliage is very nice. Not to mention, they hide what is behind them, which in my case is a privacy fence in my garden. They are large enough that they provide privacy all on their own, even without a fence behind them. Are people afraid of a large plant that isn't a tree? What's wrong with people? Get brave, plant large shrubs! Plan for it now. Fall will soon be here, and we know that fall is for planting! I noticed that Blogger has a new release of software that I will need to upgrade to at some point. Right now, it is beta software, meaning that it is released for use, but there are known issues that they are still working on. I think I will wait to upgrade my sites because there's no going back after you do the upgrade. Plus, I tried to get to this garden/landscape blog, because the blog author appears to have upgraded to the new version, and I wanted to check it out, but I get errors when I try to do so. If anyone is using Blogger like me and has upgraded already, and has some lessons learned to pass along, please leave me a comment! I think they've added some nice features, so I actually do look forward to upgrading. I also have a blog not related to gardening. It's where I post entries from my grandmother's diaries, one day at a time, as she wrote them in the 1920's. There are a few family members and some people who just discovered it by chance who seem to read it regularly. I also added a companion blog for these diaries to post old family pictures related to the diary, so they also would not just archive away with the diary. It takes just a few minute a day to post, with a few of my comments, and I think people get hooked wondering what will happen next. Sometimes it goes for days with nothing of great interest and then something will happen. Just like real life. Oh, I forgot, it is a real life! Now, go plant some large shrubs! Hey, thats my Blog you tried to get on. Did you get in? Beta version is/will be great. I am especially happy with changes to manipulating template, and how they've changed posting. 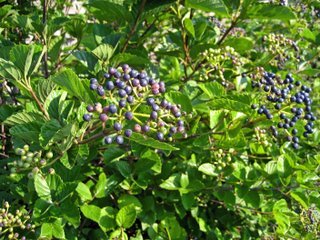 btw, Along with viburnums, don't forget elderberry, sumac, bottle brush buckeye, hydrangea, hollies, new forsythias, etc., etc., etc. I think fondness for large shrubs is related to the size of your yard. When we had a nursery in more populated Auburn people in subdivisions were often nervous about how big shrubs get. “I don’t want to have to prune it”. Now up here in the mountains people have large areas to cover, and large growing shrubs are popular. They have to be deer resistant to really be popular around here. Trey, I agree the size of a yard can dictate if large shrubs are appropriate. But, I don't see them in large yards, either. I think people are just a bit afraid of them. Rick, I'm still having problems accessing your blog? Any other complaints? I've tried from two different PC's. Next time you're over, give me some advice -- I'll be happy to plant some large shrubs! Hi -- I just found your lovely blog via the Garden Tour. I just started a blog for my eBay business with the Blogger beta yesterday and it is so easy to use -- though I didn't see any of the new templates they claim are on offer. My garden blog hasn't switched over yet -- at least if it is, I didn't do anything to in and it still is just the same, though both blogs show up on Dashboard -- but it doesn't look like it will be too difficult to do. Now back to the gardening -- no large shrub to plant - will a large clump of zebra grass do?